Glaskogens Camping is centrally located in the Glaskogen nature reserve, between the two lakes, Stora and Övre Gla in the village of Lenungshammar. Lenungshammar is a small, peaceful village with about 30 inhabitants. 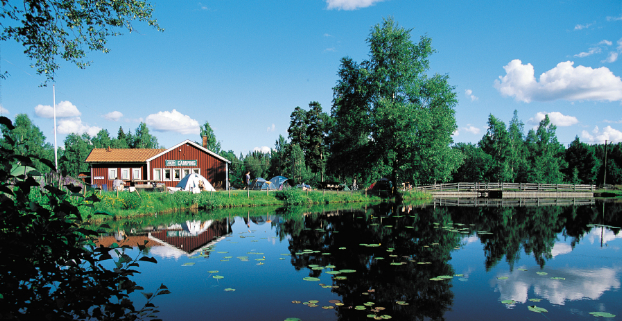 If you enjoy the outdoor life and fishing, Glaskogens Camping is the ideal place for you. The caravan sites are well spaced apart and there's plenty of forest in-between. This makes every site its own little campsite. For many, Glaskogens Camping forms the starting point for further adventures and day trips into the reservation. This reservation, which is 28,000 hectares has around 300 km of walking track. For canoe and fishing enthusiasts, Glaskogen's many waterways is a must, as are the numerous gravel paths for cyclists. Bikes and canoes can be hired. If you want to explore beyond Glaskogen, the west of the county of Värmland has many sites of cultural interest, within convenient distance for day trips. Places of interest include Von Echstedska manor in Kila, Klässbols linen weaving factory, the Rackstad museum in Arvika, Morokulien in Eda and the new Travmueseum in Årjäng.